Pinot Noir. Founded in 1994 by Adam and Diana Lee on a shoe string budget, the Lees have developed Siduri into a winery producing more than twenty Pinot Noirs, the majority being single vineyard. Their love of Pinot Noir and their passion for work has earned them praise from such notables as Robert Parker (“One of California’s top Pinot Noir producers. One of my favorite wineries.”) to Antonio Galloni (“Siduri’s appellation level Pinots are wines that consistently over deliver.”). Add Matt Kramer’s comments (Wine Spectator) from his new book, New California Wine: (“To taste Siduri is to taste some of the best Pinot Noir made in America today.”). I’d be thinking too much of myself to think I could add anything of more weight to these comments from such notables. But in fact, comments from such heavy weights can have the effect of scaring away some consumers, leading them to believe the label may be too expensive for their budget. Siduri has completed an end run pass around this problem by working with more than twenty vineyards. They maintain a bare bones operation, making only Pinot Noir. And visiting the winery, you won’t see an expensively appointed tasting room. The opulence is solely in the wine. Hence the cult following that recognizes both good Pinot Noir and a bargain. 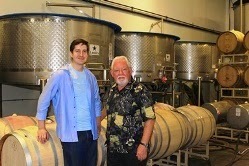 I recently tasted a 2012 Santa Lucia Highlands Pinot Noir, for example. The wine is a blend from five sites the winery works with. But Siduri vinifies each wine separately by block, clone and barrel type to maximize individual components and provide greater complexity to the final blend. In the glass, the wine is ruby colored and offers aromas of cherry and blackberry. But I was most intrigued by the nose of white smoke, flowers and musk. This was a supple, juicy Pinot with silky tannins and a pleasing, cleansing zesty acidity. I tasted dark mashed plum and the wine played a savory-sweet balancing act of cherry and vanilla notes along the way. A hint of black pepper accompanied the dry finish. The wine is fermented with 20% whole clusters and a blend of wines from both the cooler northern end of the Santa Lucia Highlands (Rosella’s, Garys and Soberanes Vineyards) and the warmer southern end of the appellation (Sierra Mar and Pisoni). Temperature (and other factors) play an important role in how grapes ripen and in what they offer as wine and partially explain why you may like a pinot one day and not the next. By blending wines from both areas, after vinifying each separately, Siduri offers an entry label Pinot Noir of considerable elegance by itself or with food and one which tastes higher than it is priced (ARP $31). 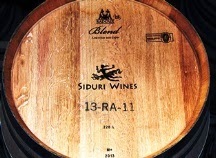 Siduri has never filtered or fined any Pinot Noir. Their belief is that doing so, more often than not, the wine is stripped of its flavor and character. There is no way for me to taste this same wine having undergone such procedures. But having tasted this wine as it is, there is no reason for me to want to. Follow Wine Mizer on Face Book for mini-reviews, recipes, fun facts and more. Follow WineMizer on Twitter.